Aging takes a toll on our bodies, and it’s not always fun either. Nancy Vaughan knows that and she’s making it her personal mission to address both. Through her strength training and water aerobics classes targeted primarily for women 60 and older, Nancy is telling age and gravity to take a hike – or pick up a kettlebell. For most of her working day, Nancy is the wellness program administrator, student strength coach, and associate director of student activities at The Hotchkiss School in Lakeville, CT. There, she works with students, faculty, and staff on fitness, diet, healthy living, and fun. Crammed into those full days are the extra hours she devotes to keeping this area’s female elders fighting fit. For over 13 years, Nancy has been running water aerobics classes on a volunteer basis in partnership with Salisbury Recreation Commission and Hotchkiss. For the past five, she has developed two land-based classes with differing intensity levels hosted in the Hotchkiss wrestling room. Using her nursing background plus her exhaustive and exhausting list of additional certifications as a personal trainer, weightlifting performance coach, functional strength coach, and movement and mobility specialist she is an effective blend of compassion and drill sergeant discipline. She pushes her mature students hard, but always within what their bodies can tolerate. Nancy is grateful to Hotchkiss for the chance to make a difference both within its community and the community at large. From this writer’s perspective, Nancy’s classes are arguably one of the most profound ways that Hotchkiss improves the lives of local residents as part of its good neighbor policy. 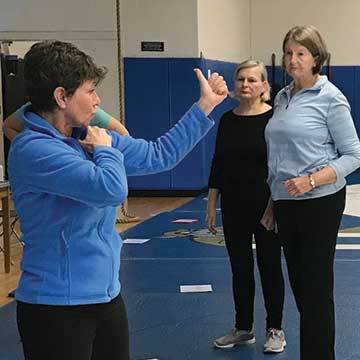 Nancy observes, “My work with the women in my class centers on increasing power – making their bodies move more explosively, quickly, and with conviction. Our ability to generate power is lost at a greater pace as we age, more than our strength and aerobic capacity. I’m also trying to get that neurological conversation between head and feet to happen again. Somewhere along the path of aging, those two parts of our body stop talking.” For some women, remembering how to jump is such an act of concentration that Nancy starts them out with literally jumping over the seam in the wrestling mat. For new class member Joanne Hayhurst, “Nancy brings dignity to women of a certain age.” This sentiment is echoed by every student. They’re not talked down to, coddled, or treated as less capable due to their age, which ranges from early 60s to mid 80s. Nancy meticulously explains how the deadlifts they do in the class use the same body mechanics and require the same attention to form as lifting a bag of birdseed or a bedbound husband. Janice Fitch, a retired physical education teacher with old volleyball war wounds, appreciates the diversity of Nancy’s fitness offerings. “We use the boxing gloves and weight bag and run sleds when the wrestling mats are up.” Running sleds? Yup, the same ones the football players are pushing in practice. Janice reels off a list of new activities Nancy has introduced the group to, including paddleboarding and pickleball. For Nancy, all work and no play makes for a very dull workout. That’s why she injects fun and spontaneity into the classes. Nancy’s infectious and irreverent sense of humor keep the class lively and sets a playful tone. Donna Durbridge of the 9am class is the social coordinator for NOGs – Nancy’s Old Girls. Twice a week after class, they head out for coffee and twice a year they gather at Donna’s house for a BBQ and holiday celebration. New members of the class are always welcome and embraced. Nancy’s water-based classes are also a worthy workout with a large social component. The intensity and cardio benefit in the water vary with individual effort and the use of the resistance hand and ankle accessories available at the pool. These classes are an effective complement to the land-based workouts. Nancy explains, “Water workouts involve less joint trauma. The weightlessness created in the water produces a balanced workout. Opposing muscle groups must fire for each movement without gravity interfering.” In Nancy’s experience, water workouts are the perfect place to begin exercising if you’ve been inactive. Groovy 50s and 60s music plays in the background. Nancy stands poolside and calls the exercises, demonstrating what they’re supposed to look like underwater and providing visual entertainment doing the Twist, imitating Elvis, and playing a mean air guitar to Credence Clearwater Revival. Women chat while bobbing up and down, creating waves, and laughter. For more information about the classes, availability, fee information, and schedule, email Nancy Vaughan at nvaughan@hotchkiss.org or call her at (860) 435-3163.